In 2-quart saucepan, heat beans and taco sauce over medium heat 4 to 5 minutes, stirring occasionally, until heated. 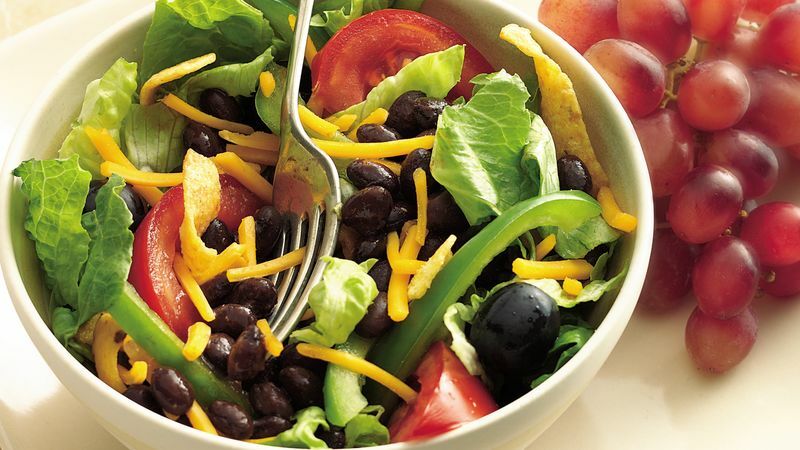 In large bowl, toss lettuce, bell pepper, tomatoes, olives and corn chips. Spoon bean mixture over lettuce mixture; toss. Sprinkle with cheese. Serve immediately with dressing. One simple substitution of reduced-fat cheese cuts the fat back to 8 grams and trims the calories to 280 per serving. For a heartier meal, add 2 cups cut-up cooked chicken to the salad and serve with 1/2 cup red or green grapes for a mere 3 Carbohydrate Choices. Thousand Island dressing is named after the Thousand Islands in upstate New York. It was served to fishermen on "shore dinners" and became so popular that the recipe spread throughout New York and across the U.S.